The Georgia Assembly reconvened last Monday for their second week of the current legislative session. The major juggernaut of last week was the introduction of the House’s plan to fund transportation projects throughout the state. The Transportation Funding Act of 2015 will reorganize local and state fuel taxes into one statewide tax that will provide transportation funding for the state government. This is good for transportation funding, but very bad for local governments since the state will essentially be taking valuable revenue from local governments. In addition to this bill, we’ll provide updates on the bills currently being tracked and introduce two new bills. This the second installment of a weekly segment looking at the bills being introduced in the Georgia Assembly that involve land use, environmental, and transportation issues. Please see the 2015 Legislative Session page for ongoing coverage. After the failed T-SPLOST referendum several years ago and a recent report claiming that Georgia needs $1.5 billion for transportation infrastructure, the Georgia Assembly had its work cut out for it in crafting legislation that would provide needed transportation funding. Last week we saw what they had up their sleeves. Currently, the state assesses two state-wide taxes on fuel: a flat excise tax of 7.5 cents per gallon and a sales tax of 11.8 cents per gallon. In addition to this (and the federal gas tax) local governments can assess up to 8.9 cents per gallon in additional taxes. The money raised through these local taxes must be used for certain special projects including transportation and schools. The Transportation Funding Act of 2015 (Act) cancels the local gas taxes and sets a new state-wide gas tax of 29.2 cents per gallon. Local governments will no longer be able to tax gas to pay for schools. Essentially what the state legislature is is saying is that most people already pay x amount in gas taxes because of local taxes, so we’re just going to institute a state tax in x amount and cancel all the local taxes. On average, Georgian’s pay just over 27 cents per gallon in state and local taxes, so this would raise the gas tax for most people in the state. However, it would still be below the national average for state and local taxes – 29.89 cents per gallon. According to the Act, this state-wide tax will rise and fall based on inflation. Local governments should be (and are) upset about this proposal. They used to be able to tax gas in order to pay for schools and now they longer have that ability. On top of the statewide 29.2 cents per gallon, the Act does allows local governments to assess an additional 6 cents per gallon in taxes (currently they can do 8.9 cents), but all the money generated must be used for transportation purposes. So in order for local governments to continue to get the money they already have for transportation and schools, they will have to pass ordinances and ask voters to raise taxes. This unequivocally means either higher non-gas taxes for many counties or less money for schools and local transportation projects. The Act shows that state legislators realized the need for tax increases, but instead of raising taxes themselves, they decided to take money from local governments and make those governments raise the taxes. Most of the data from above comes from a great AJC article by Aaron Gould Sheinin highlighting the Act. It’s important to remember that this Act isn’t really a transportation “plan” of any sort. It is solely a funding mechanism. The T-SPLOST referendum that failed miserably several years ago was a solid plan; it divided the state into transportation regions and asked the voters in each region to collectively raise the sales tax by a cent in order to fund specific projects designed to help the region as a whole. The Transportation Funding Act of 2015 is a response to that failed effort. Unfortunately, that failed effort is exactly what we needed. This Act will raise the billions we need for transportation, but who knows how that money will be spent. 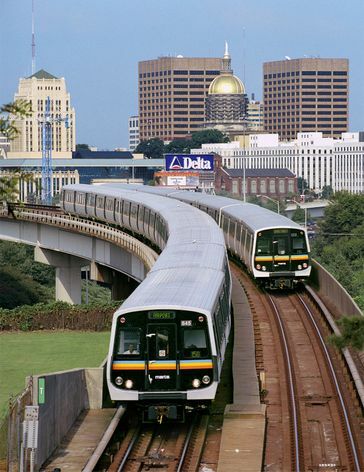 The Act allows local governments to raise money for transportation purposes, but this is still a highly localized way of dealing with regional transportation issues. The proposal by the House did come with one extremely positive note: Republican leaders stated that they plan on generating $100 million for transit purposes. This would come from borrowing, as well as from a new tax on electric vehicles. Funding for transit would be a significant first step in getting the state to fund something other than roads. We’ve heard it many times before, but MARTA is the only major transit system in the country to receive no state funding. No state funding! House leaders indicated that they are reversing course and heading down the road of supporting transit and funding it, though there are no specific plans. Ultimately we’re probably going to have to take another shot at passing regional transportation taxes that bind revenue to specific and diverse transportation projects similar to the ones that failed with the T-SPLOST referendum. To all those that opposed the T-SPLOST referendum or just didn’t show up to vote, I hope that referendum is increasingly looking like a major failed opportunity. Expect to see more about this bill in the future. This bill allows brewpubs and breweries to sell beer for consumption on their premises, like a bar or restaurant, as well as for consumption off their premises, like a package store. I’ve written a couple articles talking about the need for such a bill in the context of urban renewal and revitalization. Essentially, a brewery or brewpub can generate much more pedestrian traffic if it is allowed to operate like a bar, which ultimately is good for commercial neighborhoods. See the most recent article about this here. This bill allows cities to take more progressive moves in the rehabilitation of neighborhoods. The current Urban Redevelopment Law allows local governments to acquire “slum” property for the purpose of “rehabilitating” it. For one thing, this bill changes the word “slum” to “blighted area;” a bit of a superficial change. However, it also adds a bunch of substantive progressive changes. The current law only allows local government to acquire “slum” property under this law for the purpose of lessening density. This bill also allows governments to increase density. Additionally, it allows rehabilitation programs instituted under the law to build things like sidewalks and transit facilities. This is a major addition since the current law only recognizes surface streets as an improvement to a neighborhood. This bill was actually proposed last legislative session and passed both the House (158 to 4) and Senate (30 to 19) . The Senate passed a substitute bill, which did what this bill currently does and replaced “slum” with “blighted area,” but the House never got around to voting on that substitute bill, so it never made it to the Governor. Considering the House overwhelmingly passed the bill last year and this bill adopts the changes approved by the Senate last year, expect the bill to move to the Governor. HB-4: Allow Interbasin Water Transfers from Certain Rivers into the Metropolitan North Georgia Water Planning District. Still has not been assigned to a committee, so no changes. HB-11: Preventing New Cities from Being Formed in Such a Way as to Create Islands of Unincorporated Land. Assigned to the House Governmental Affairs Committee and is currently in the Second Readers stage of the committee. SB-36: Prohibit the Storage of Groundwater in the Floridan Aquifer. The House filed a similar bill, HB-116. The Senate bill has been assigned to the Natural Resources and Environment Committee and is currently in the Second Readers stage. HB-57: Financing of Solar Power Technology on Private Land. This bill was favorably reported by the House committee, so it should go to a full House vote soon. Last week featured a larger discussion of this bill. Please the first week’s edition for a background on these bills.